Hearing aid technology has come a long way in recent years. These days, you’ll find a range of hearing aids from manufacturers that are smart, digital, wireless devices with a high level of performance. In general, hearing aids share similar components to achieve the purpose of amplifying sound and delivering it with clarity. All hearing aids have a microphone, amplifier, battery, volume control, a processing platform, and a unit that houses all of these parts. There are many styles of hearing aids, designed to treat a diverse range of degrees of hearing loss and needs. Most hearing aids are fully customizable and are tailored to meet your specific hearing requirements. Here at Clarity Hearing, we are proud to offer hearing aids from the following manufacturers. Founded in 1964 in “Canada’s Silicon Valley,” Unitron is a subsidiary of the Sonovo Group and is a global provider of hearing instruments. In addition to their constant research and development into the newest hearing aid technologies, Unitron works with communities around the globe to raise awareness on hearing loss and collaborates with entities such as the Global Foundation for Children with Hearing Loss and the Hear the World Foundation. Unitron’s latest hearing innovation is the North Processing Platform, which improves speech recognition and sound clarity against background noise. Unitron hearing aids include Stride, Moxi, and Max, available in different technology levels for different degrees of hearing loss: Entry, Mid-Range, Advanced, and Premium. Unitron’s TrueFit software allows hearing professionals to tailor Unitron hearing aids to their clients’ specific needs. A household name for quality manufacturing, Siemens is also a leading manufacturer of modern hearing aids. Since 1913, Siemens has been on the forefront of innovative technology offering advanced hearing instruments for people with a wide range of hearing loss. 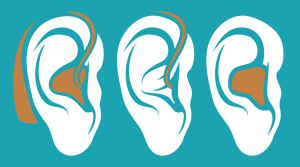 In 1959, Siemens developed the first hearing aid word behind the ear and in 1966 the first in the ear hearing aid. More recently, Siemens developed waterproof hearing aid technology allowing active people to keep their hearing aids in place while they shower, swim or find themselves in the rain. Their most recent product, the binax, won the 2015 Gold Edison Award. This smart hearing aid actually provides wearers with the ability to hear better than those with normal hearing in challenging listening environments. Siemens hearing aids are available in a wide range of wearing styles, colors and levels of technology so that you can find the right solution for your lifestyle and preferences. Based in Eden Prairie, Minnesota, Starkey is an American manufacturer of hearing aids founded in 1967. In conjunction with the Starkey Hearing Research Center in Berkeley, Starkey Hearing Technologies has developed some of the most advanced hearing devices available today, from their Halo Made for iPhone hearing aid (winner of the 2015 Silver Edison Award) to the Z Series hearing aids. Starkey’s latest offering is the Muse Made for Life hearing aid, which is powered by a new Synergy platform, which five times the processing power of previous Starkey hearing aids. Speech recognition, comfort in noise, a high-quality music listening experience, and ultra-high definition audio experience in everyday situations are just a few of the features offered by Starkey’s Muse. Starkey hearing aids are available in many different styles, and some are equipped with tinnitus therapy. Founded in 1991, Sonic Innovations is an American manufacturer of hearing aids which began in Utah and is now based in New Jersey. Funded in part by Utah’s Center for Excellence program, Sonic Innovations launched their first product, the Natura hearing aid, in 1998. Sonic Innovations offers hearing aids that are stylish and easy-to-use, with models such as Celebrate, Cheer, Journey, Bliss, and Charm. All Sonic Innovations hearing aid models come in a range of styles, from behind-the-ear, to receiver-in-canal, to in-the-ear, to completely-in-canal. They also service people with different degrees of hearing loss, from mild to profound. Sonic Innovations products are endowed with a Speech Variable Processing Platform, which provides better speech understanding, binaural processing, and wireless connectivity. Danish manufacturer ReSound began their work in 1943 and has since become a leader in hearing aid technology. Their early contributions to hearing instruments include Wide Dynamic Range Compression and Digital Feedback Suppression, two processing systems to improve listening experiences for their wearers. ReSound is known for their innovative LiNX2 Made for iPhone hearing aid, one of the world’s first hearing aids designed specifically to connect to smartphones. This design opens up a world of accessibility for LiNX2 wearers, allowing them control and access of their hearing aids via iPhone and geo-tag functions. ReSound also offers the ENZO2 for people who experience severe to profound hearing loss, with a stronger sound signal and improved amplification. We have a large selection of hearing aids in stock, and we carry all major brands! Call (520) 219-1151 for an appointment.